So, you are looking for a great sounding guitar combo. Something like the versatile Fender Hot Rod Deville. Which speaker configuration should you go for? The 2 x 12” speakers or the 4 x 10” speaker version? Well, both speaker sets have their champions, and in fact we find that many artists will only take their preferred speaker configuration in the Fender Hot Rod Deville, even though the amp is the same. Because naturally the sound is going to be different. 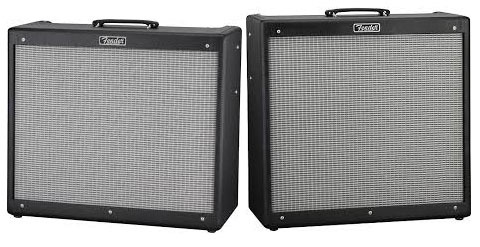 Both the 2×12 and 4×10 set of speakers have fantastic, iconic pedigree, evolving as they do from the classic Fender combos of the 1950s/60s. Popularly, the Fender Twin amp with the 2 x 12 speakers, and the Fender Bassman housing the 4×10 speakers. So let’s not get bogged down with which is better. That’s like trying to choose between a Les Paul and a Strat! Personal preference aside then, and accepting that everyone has their own unique set of ears (don’t we know it! ), we can say that the 4×10 version has a punchier, tighter sound, perhaps more suited to pop/funk. Whereas the 2×12 has a sound closer to classic rock, with stronger low end and mid tones. You want to sound like Nile Rodgers, choose the 4×10. You want to sound like Michael Landau, choose the 2×12.